We made an expedition to Cañada de La Virgen, near to San Miguel de Allende, Guanajuato, with colleagues from the Seminar of Archaeoastronomy of ENAH-UNAM. It is an old Otomian site, occupied since before 700 BC and until around AD 650. They built it to follow sky events, and particularly, to follow eclipses. 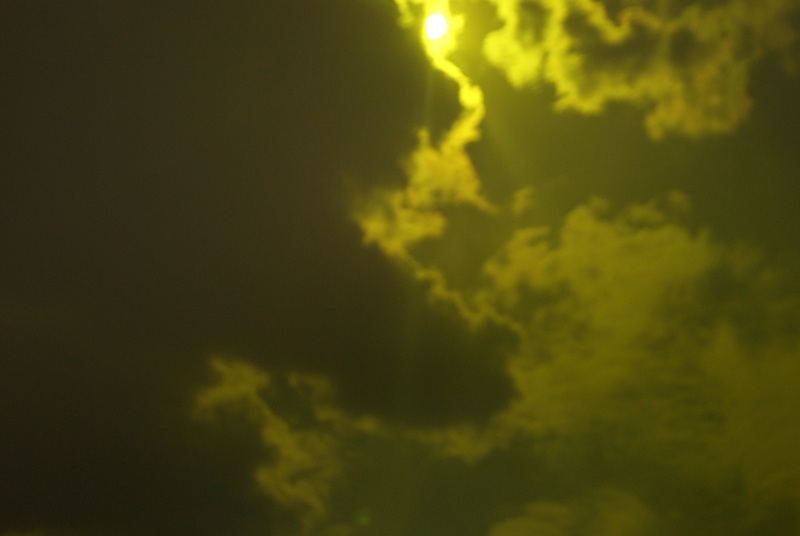 On June 5th, on day 10 Lamat (10 Star in Yukatek Maya) –according to the correlation I have proposed since 2010– the morning was bright and clear, but at around 2pm clouds began to appear here and there, and kept gathering until we became quite worried. We began to set the equipment in place on the northern side of Complex B with a mixture of expectation and uneasiness, since a huge dark cloud was right in the way. All was set, and still cloudy until, at 4:16, the Sun’s rays began to peep out, and at 4:24 the spectacle began: the Sun was out in a clear sky and Venus was just coming in (contact II). A venusian breeze (Ik’) had told me minutes earlier it was about to come in action. And it did, majestically. Sun coming out just on time for our observation of Venus II Contact with the solar disk. We were all overwhelmed by the image that could only be seen with the help of an obscure lens, or by projecting the image on a white surface. When the Sun’s gleam was less strong, later on that afternoon, we obviously tried using the naked eye and experimented with all sorts of obsidian glass-pieces, but there is too much distortion and no possibility of discriminating the little black spot produced by Venus. So what can be preliminarily concluded is that the ancestral astronomers definitely knew that Venus was passing across the Sun every 584 days, and that it was not visible for this reason during 8 days, and could even calculate it being at the middle of its trajectory on day 4. But apparently they never knew whether a particular passage was more conspicuous than another, because it seems that there was no way that the naked eye could help identify a pattern regarding the way Venus moves in front of the Sun. 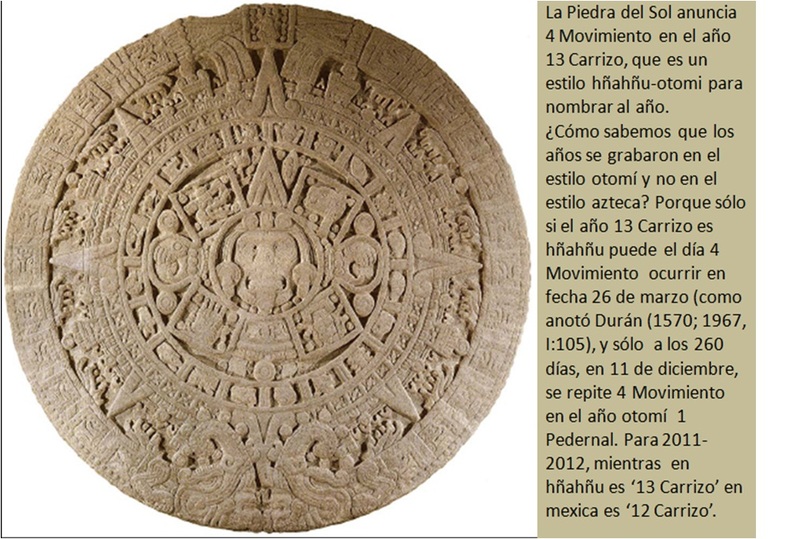 On this particular year 2012, occurring within years 13 Reed and 1 Flint as named by Otomian peoples, they did know that on day 4 Movement the Sun would threaten the Moon, making her time end 8 days after day 1 Rain** (a date carved on the Piedra del Sol stone meaning May 27, 2012) i.e., on day 9 Deer, or June 4, 2012. On the day after 9 Deer (i.e., 10 Star/Rabbit, June 5, 2012) Venus would be halfway through its passage across the Sun’s face (right in the middle of the Piedra del Sol we see the expression of the Sun’s suffering due to this eclipse provoked by Venus, by Tezcatlipoca*) terminating the Fifth Sun’s cycle. However, this cycle is not only time-reckoned by the Sun, but also by the Moon and Venus, so the very last event that is directly related to the completion of the Fifth Sun is the one happening on December 11, 2012, as is explained next. Indeed, both 4 Movement dates (March 26, 2012 and December 11, 2012) are denoting very specific Moon events, which have in common the fact that Venus is in close conjunction with crescent and waning moons, respectively. Venus in its evening aspect on the first date (March 26, 2012) is depicted on the stone as the Jaguar of the underworld, hence the claws on the left hand side of the Movement glyph close to the Death/Skull glyph of the ring of 20 day-signs. On the second date December 11, 2012, Venus will be in its morning aspect which is symbolized by the Eagle, hence on the Otomian Piedra del Sol we see the claws on the right hand side of the Movement glyph in close proximity to the Eagle glyph of the ring of 20 day-signs. The Jaguar (vespertine Venus) is the agent, the one causing the eclipse; it seeks to bite or devour. This means that what we have to look for is: Venus at the time of close proximity to the Moon -when the Moon is in its first couple of days of visibility in the West sky. This type of conjunction is astronomical knowledge that even Mapuche people know today (my notes, 2010). What we have in the Piedra del Sol or the Otomian Stone is the result of a means to reckon the timing of the five big Moon-Venus-Sun cycles. The last event wrapping up the Fifth Sun, shall be Morning Venus in conjunction with a waning Moon on December 11, 2012. On this occasion eclipses will have already occurred on November 13, 2012 (solar) and November 28, 2012 (lunar). 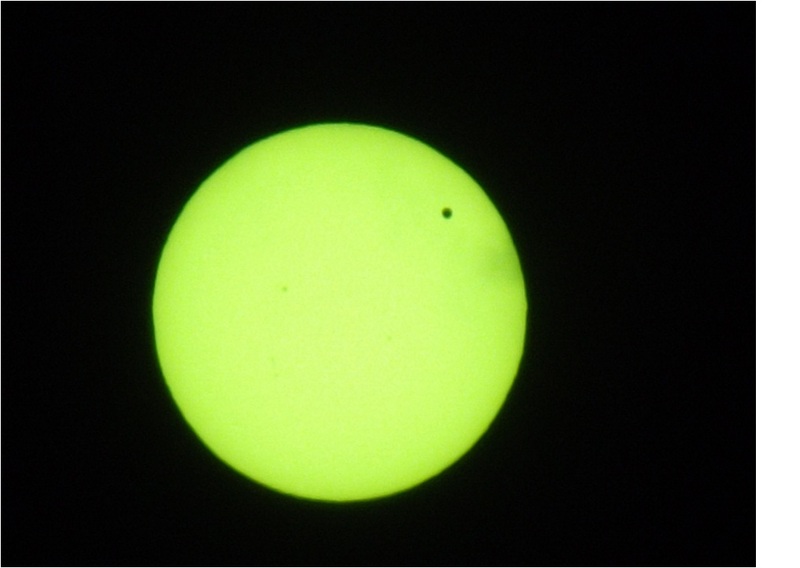 Transit of Venus on June 5, 2012, approximately 5:16pm. Taken at Cañada de la Virgen site by Ricardo Moyano. *Tezcatlipoca is the evening aspect of Venus. **(All four dates are on the Piedra del Sol, and can be correlated to Gregorian dates only with the Correlation I propose, i.e.Otomian year 13 Reed = March 29 2011 – March 28 2012; Otomian year 1 Flint = 29 March 2012 – 28 March 2013; day 4 Movement = March 26 2012 and 260 days later 4 Movement = December 11 2012; day 1 Rain = May 27, 2012 + 8 days = June 4, 2012; and May 27, 2012 + 9 days = June 5, 2012).